First seven months of the current fiscal year have seen tractor sales soar 45% to 38,173 units, according to data of the Pakistan Automotive Manufacturers Association. It is driven by a combination of soaring credit availability and bumper harvests of Pakistan's top three crops by area: wheat, cotton and rice. First seven months of the current fiscal year have seen tractor sales soar 45% to 38,173 units, according to data of the Pakistan Automotive Manufacturers Association. This is good news for Pakistan's tractor industry that has been in slump for several years as the agriculture output was stagnant. Pakistani farmers use tractors for a variety of usual tasks ranging from tilling and planting to harvest and transport. Tractor owners recover their costs from more efficiently working their farms and renting out equipment when they are not in their own use. Pakistani banks provided Rs 500 billion (nearly $5 billion) worth of agricultural credit during the first seven months, July-January period, of current fiscal year. It represents a 45% jump from the same period last year, according to media reports. According to State Bank of Pakistan (SBP), commercial banks, specialized banks, Islamic banks, domestic private banks, microfinance banks and other microfinance institutions have together disbursed Rs 499.645 billion during the period under review, up Rs. 351.358 billion in the same period of last fiscal year. Wheat output is expected to be near all time high of 26 million tons. Cotton production is forecast to exceed 11.5 million bales, up from 10.6 million bales last year. Pakistan rice exports have reached 2.59 million tons worth US$ 1.224 billion in the first 7 months, up from 2.27 million tons worth US$.961 Million last year, recording growth of 27% in value and 14% quantity. Pakistan ranks among the world's biggest producers of a variety of crops including wheat, cotton, rice, corn, sugarcane, onions, chickpeas and fruits, according to Food and Agriculture Organization Stats (FAOSTAT). 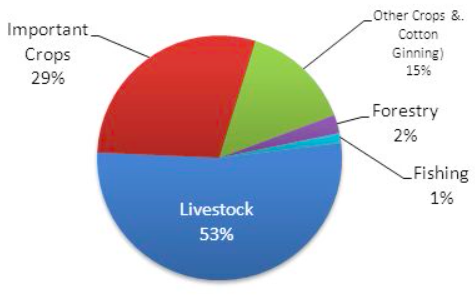 Livestock farming contributes 53% while crops make up about 42% of Pakistan's agriculture output. The rest comes from fishing and forestry. Pakistani livestock sector has growing much faster than the crop sector and more recent estimates show its contribution has increased to 56.3% of the value of agriculture and nearly 11% to the agricultural gross domestic product (AGDP). It's driven by growing domestic demand for meat and dairy products. Pakistan's crop yields are comparable to India, among the lowest in the world, according to FAO (Food and Agriculture Organization) data. World's highest crop yields are seen in Europe while the lowest are in Africa. Beyond the current phase of China Pakistan Economic Corridor (CPEC) focus on energy and infrastructure projects, there is a long term plan that deals with modernizing Pakistan's agriculture. CPEC LTP outlines a more comprehensive effort involving the entire supply chain from agriculture inputs like seeds, fertilizer, credit and pesticides to logistics such as storage and transportation systems. Pakistan ranks among the world's top producers of a number of major crops including wheat, cotton and rice. Soaring tractor sales are being driven by a combination of rising credit availability and bumper harvests of major crops in the country this year. But the farm productivity and yields are still among the lowest in the world. CPEC LTP (long term plan) offers hope of significant improvements in agriculture sector to reach its full potential. The productivity gap is demonstrated by a wide difference between average yields in Pakistani and Indian Punjab. These two provinces have same topography, climatic conditions, soil characteristics and plant diseases, yet the Pakistani side remains far behind the Indian side. Punjab’s average yield for wheat, sugarcane, rice and maize remains 25-45% behind average yields in Indian Punjab and about 45% behind progressive farmers in Punjab province (Pakistan). This deficit is costing Punjab about $6 billion in nominal GDP every year and is attributed to several reasons. Hasaan: "Pakistani side remains far behind the Indian side. Punjab’s average yield for wheat, sugarcane, rice and maize remains 25-45% behind average yields in Indian Punjab and about 45% behind progressive farmers in Punjab province (Pakistan)"
FAO data shows yields of major crops in Pakistan are about the same or higher than in India. As to the difference in the two Punjabs, the Pakistani Punjab is 4 times larger (about 80,000 square miles) and has a much more varied terrain than the Indian Punjab (20,000 square miles). Pakistani Punjab has the plains, the Potwar plateau and the Cholistan desert. Yield in the plains are most likely the same as those in Indian Punjab. Good to be pulling ahead of neighborhood..Agriculture is one our strengths.. the food quality in shanghai and beijing is abysmal.. we can trade agri-products with our xin jiang brothers and buy leverage in China..
Of the major South Asian countries Pakistan has the lowest yields(Tonnes/Hectare) in wheat and rice (2014). Data from previous years show that in Pakistan the yields have flatlined (decreased for rice) whereas India and Pakistan once behind Pakistan have eclipsed Pakistan and are trending upwards for the last decade. 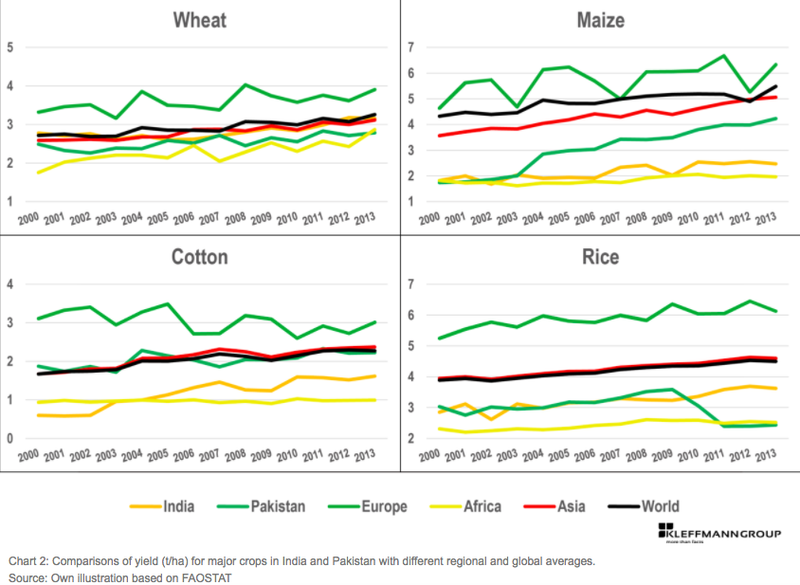 Noor: "Data from previous years show that in Pakistan the yields have flatlined (decreased for rice) whereas India and Pakistan once behind Pakistan have eclipsed Pakistan and are trending upwards for the last decade." I am not sure what is your source of data. FAO data shows there's been little change in crop yields in Bangladesh, India and Pakistan since 2014. Except for rice, maize and soyabean for which Bangladesh is way ahead, the rest of the yields are quite comparable for all three. Bangladesh land is EXTREMELY fertile and has MASSIVE amounts of silt deposited by Brahmaputra and Ganga rivers every year.Think Nile floods X 50. It is not fair to compare Bangladesh yield to water stressed countries like India and Pakistan.It is actually grossly under performing given the quality of land(Prime Alluvial) with unlimited fresh water resources. Anon: "It is not fair to compare Bangladesh yield to water stressed countries like India and Pakistan.It is actually grossly under performing given the quality of land(Prime Alluvial) with unlimited fresh water resources." Pakistan is among the most water-stressed countries while India is a little bit better. But Bangladesh is among the least water-stressed, according to Water Resources Institute (WRI). Among 176 countries ranked by Water Resources Institute (WRI) for water stress from most to least, Pakistan ranks 31, India 40 and Bangladesh 125. The ratio of water withdrawal to supply in Pakistan is over 80%, India 40-80% and Bangladesh less than 10%. In spite of water stress, Pakistan does much better than Bangladesh and India in agriculture value addition. Massey Ferguson 360 tractors are small low hp tractors. They need bigger tractors like Mahindra in India and those used in America. Singh: "Massey Ferguson 360 tractors are small low hp tractors. They need bigger tractors like Mahindra in India and those used in America." Both Massey Ferguson in Pakistan and Mahindra in India are about 50-60 hp. They are good enough for small farm sizes in India and Pakistan. The farm sizes in Pakistan are very small as in most of the other Asian countries. Approximately 89% of the farms in Pakistan are below 5 hectares and cover 55% of the cultivated area. Similarly, farm sizes in India are very small and tend to decline. The recent Agricultural Census (2010-11) reported that the average farm size in India is around 1.16 hectares. In the last Census (2005-06), it was around 1.23 hectares. 85% of the farms in India are below 2 hectares and cover 44% of the operated area. By contrast, average farm size in America is over 400 hectares that require bigger more powerful tractors. Pakistan’s economy is set to surpass last year’s growth rate, with continued strong performances by agriculture and services, and a four-year record high large-scale manufacturing growth during the first half of FY18. Inflation and the fiscal deficit were both contained, whereas revenue growth has outpaced last year’s level. The report pointed out that increased consumer spending has led to a strong growth in durables such as automobile and electronics, while the ongoing infrastructure and construction activities have stimulated the allied sectors of cement and steel. On the agriculture front, while all major kharif crops performed well, wheat production came under pressure due to lower area under cultivation. With adequate inventory of key food items, such as wheat, sugar and pulses, prices of these commodities remained low, keeping food inflation in check. Favorable adjustment in the duty structure of cigarettes led to a sharp fall in its price. Meanwhile, core inflation remained higher on average in H1-FY18 due to continuously rising education and healthcare costs. However, its pace has stabilized in recent months. The report highlighted that the growth in revenue collection outpaced the increase in expenditures in H1-FY18, which led to a broad-based improvement in fiscal indicators. The overall fiscal deficit was contained at 2.2 percent of GDP, down from last year’s 2.5 percent. Revenue growth gained impetus from greater real economic activity, rising imports (both quantum and prices), and higher sales volumes of POL products. Non-tax revenues also rose over last year, led by higher SBP profit and a surge in receipts from property and enterprise, civil administration and other miscellaneous receipts. On a cautionary note, the report added that while the real sector of the economy was performing well, the external account presented challenges. The 8-month-long consecutive export growth and a rebound in workers’ remittances were welcome developments, but they were overshadowed by rising imports. Resultantly, the current account deficit increased to $ 7.4 billion in H1-FY18, from $ 4.7 billion last year. Even though financial inflows were higher this year, they were insufficient to offset the rise in the current account deficit. Consequently, SBP’s liquid reserves came under pressure, and the PKR/USD parity depreciated by 5.0 percent in H1-FY18. While concluding, the report referred to the Pakistan economy having reached a familiar juncture, where Balance of Payments challenges warrant concerted and timely measures to preserve the macroeconomic stability and growth momentum. If the external challenges are addressed, other fundamentals are strong enough to put it on a sustainably high growth path. Pakistan's large scale manufacturing (LSM) industries grew by 6.24 percent during the first eight months of the fiscal year of 2017-18 on a yearly comparison, the Pakistan Bureau of Statistics (PBS) said on Tuesday. According to the official data, the South Asian country's LSM Quantum Index Numbers (QIM) were clocked at 145.28 points during the period for July 2017 to February 2018 when compared with 136.75 points recorded during the same duration of the previous fiscal year. The Pakistan Bureau of Statistics, which is Pakistan's premier government institution to release official economic data, said Pakistan recorded the highest growth of 4.08 percent in the indices monitored by the Ministry of Industries, followed by 1.54 percent growth in the products monitored by the Provincial Bureau of Statistics, and 0.62 percent growth in the indices of the Oil Company Advisory Committee (OCAC). In the month of February 2018, the South Asian country's industrial growth surged by 5.52 percent when compared with the same month of last year. On the other hand, the industrial growth shrank by 1.51 percent in February 2018 when compared with the growth posted in January 2018. According to the official figures, the major sectors which posted growth during the reporting period were textiles with 0.47 percent, food, beverages and tobacco with 2.33 percent and 10.26 percent in coke and petroleum products sector. On the flip side, the LSM industries which remained in the red ink included chemicals production, fertilizers production, leather products, and wood products. The Pakistan Bureau of Statistics computes the provincial QIM on the basis of the latest production data of 112 items, which is sourced from the OCAC, the Ministry of Industries and Production, and the Provincial Bureaus of Statistics. Pakistan’s current account deficit continued to expand, adding to the worries of economic managers as the gap widened 50.6% year-on-year to $12.03 billion in the nine months of the current fiscal year. The State Bank of Pakistan (SBP) reported that the deficit now stands at over $12 billion during July-March, just shy of last-year’s 12-month figure of $12.62 billion. The nine-month deficit for 2016-17 amounted to $7.99 billion. The growth in the current account deficit suggests that measures taken by the government have yet to take effect, which includes devaluation of the currency in two phases, and imposing regulatory duty to curtail imports. A widening deficit eats up a country’s foreign exchange reserves, putting it at risk of a balance of payments crisis. Economists have estimated the full fiscal year’s deficit to stand at around $16 billion. Analysts say the deficit may continue to increase by an additional $100 million per month on a year-on-year basis due to uptrend in international oil prices, as Pakistan remains a net oil and gas importing country. Experts anticipated the government would further devalue the rupee against the dollar and other world major currencies during the ongoing fiscal year to bring the currency at par with its peers in order to create some sort of balance in external trade and the overall economy. In a statement issued on Thursday, the central bank said exports of goods increased 11.97% to $18.26 billion in the nine-month period, compared with $16.31 billion in the same period last year. However, the import of goods surged 16.60% to $40.56 billion from $34.79 billion in the corresponding period last year. The influx of foreign shipments remains on the higher side due to heavy imports of machinery and other construction material for multi-billion dollar projects under the China-Pakistan Economic Corridor (CPEC). The trade deficit (of goods and services) increased 22.48% in the period under review to $26.15 billion from $21.35 billion. Workers’ remittances, which play a significant role in financing the current account deficit, has started showing positive trends in recent months due to deprecation of the rupee. Total remittances for the first nine months of the current fiscal year amounted to $14.60 billion, 3.55% higher than $14.10 billion in the corresponding period last year, the central bank reported. Foreign direct investment in the nine months improved 4.4% to $2.09 billion from $2 billion in the same period last year. However, a significant portion of the foreign investment in local businesses is coming from China. Pakistani officials have struck a cheerful note, pledging all good things for the country’s landowners and farmers. But economists say similar rhetoric preceded ongoing CPEC projects in other sectors, which in fact became plagued by exploding budgets and bureaucratic delays when the time came for implementation. China's hybrid wheat has been successfully grown in pilot areas in Pakistan, and will be introduced into more countries along the routes of the China-proposed Belt and Road initiative soon. Song Weibo, vice president of Sinochem Group Agriculture Division, China's biggest agricultural inputs company and integrated modern agricultural services operator, told the Global Times on Tuesday that the company's hybrid wheat, using the two-line hybrid technique, has been harvested on a large scale in Pakistan, and is also highly praised in Bangladesh and Uzbekistan. The company will continue to promote hybrid wheat in other Belt and Road countries and establish demonstration bases in Europe and North America, Song said. An expert at the Beijing Academy of Agricultural and Forestry Sciences (BAAFS), Zhang Shengquan, who oversees the hybrid wheat project in Pakistan, told the Global Times on Tuesday that wheat production in northern Pakistan increased 50.1 percent between 2017 and 2018, citing data from Pakistan's University of Agriculture Peshawar. Data from Pakistan-based Guard Agricultural Research and Services Company shows that during the same period, wheat production in the country's middle regions has increased by 45 percent, Zhang said. Analysts hailed the project as a typical example of China's commitment to transfer advanced technologies and promote regional development in the framework of the Belt and Road initiative. China is promoting domestically developed hybrid wheat for commercial purposes. The two-line hybrid technique is often used in hybrid rice and wheat. It can increase wheat production by 20 percent. The technique was developed by BAAFS' Engineering Research Center for Hybrid Wheat in 1992. The hybrid wheat has been proven to outperform standard wheat in terms of yield, water usage and resistance to disease. Song told the Global Times that Sinochem has sent many experts to Pakistan to teach local farmers how to grow the wheat. "Around 150 experts have been sent to Pakistan, where they visited over 20 cities." Zhang said that drought and high temperatures are the major challenges to planting hybrid wheat in Pakistan. Frequent changes in Pakistan's governments also make it difficult to sustain the project, he noted. University of Agriculture Peshawar professor Muhammad Arif told China Radio International that the world has been studying hybrid wheat but no one has achieved China's level of success. With help from Chinese experts, the technique could yield around 6,000 kilograms per hectare, twice that of local wheat production, Arif said, adding it could free up land for other agriculture products. "Pakistan's population has been rapidly increasing, but the country is short on farmland. The project is win-win cooperation," Zhao told the Global Times on Tuesday. Sinochem said the company has also been promoting hybrid rice technology in Bangladesh since 2015. In October 2016, the company launched the first overseas development center in Bangladesh and helped the country conquer agriculture obstacles by developing a variety that suits local cultivation conditions and consumption customs. The potential of and challenges to Pakistani tractors. Agriculture is the mainstay of Pakistan’s economy; it therefore follows that agricultural machinery holds significant value for the country. Tractors account for most of the farm mechanisation in Pakistan and we are now on the verge of complete localisation in terms of production. The tractor market is growing and in 2017, over 60,000 tractors were sold. The market is dominated by three manufacturers. Millat Tractors (Massey Ferguson), Al-Ghazi Tractors (New Holland – formerly Fiat) and IMT Tractors; their market share is 60, 35 and one percent respectively. 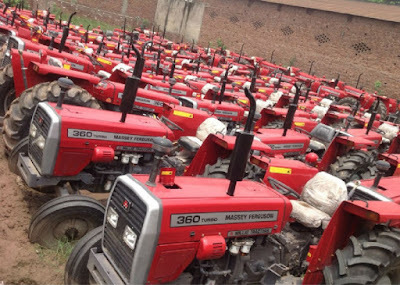 Smaller brands, such as Belarus Tractors, John Deere and others, import tractors as completely built-up units (CBU) and semi knocked-down (SKD) units and cater to the remaining four percent. Production capacity stands at 70,000 units per annum and models range from 55 to 85hp. Thanks to an indigenisation programme initiated in the eighties by the Pakistan Tractor Corporation, the industry has achieved 95% localisation in terms of production. “Labour is cheap and we indigenised production a long time ago. We are only importing five percent of the components, mainly pistons and fuel pumps as completely knocked-down (CKD) units. So there is no amortisation cost; hence, we only have the variable cost of production. This is why, Pakistan makes the lowest priced tractors in the world. A 55hp tractor that costs about $7,000 in Pakistan would cost in the region of $20,000 in Turkey, $25,000 in Europe and $30,000 in USA” said Saeed Mushtaq, Head of Marketing, Al-Ghazi Tractors. The low prices of Pakistani tractors have given manufacturers an edge in international markets who are exporting to Afghanistan and many African countries. However, exports are limited to certain countries due to internal agreements between the brand owners and their Pakistani producers and because of the lack of technological advancement in Pakistani tractors. Yet, despite the lower prices, penetration in Pakistan still stands at 0.9hp per hectare of cultivable land, much lower than the international norm of a minimum 1.7hp per hectare. This is because the sales depend on the interplay of numerous factors, including the availability of capital for the farmer, interest rates on lease, government subsidy programmes for the purchase of tractors and fertilisers as well as the presence of small and scattered landholdings. Growth in this sector is still not stable and there are spells of extremely high and low sales. Sales decline considerably when farmers bear losses and bounce back when the government initiates farmer-friendly policies or there is a bumper crop. The average agricultural landholding size is approximately 12.5 acres, due to which it is not viable for most farmers to invest in a tractor unless banks provide leasing facilities on low mark-up rates or the government provides subsidies on their purchase. 3 1991 Census of Agriculture as the main source of information on human, draft animals and machine power. (PDF) Farm Power Available for Utilization in Philippine Agriculture. Available from: https://www.researchgate.net/publication/315783506_Farm_Power_Available_for_Utilization_in_Philippine_Agriculture [accessed Sep 03 2018]. (PDF) In Pakistan, Agricultural Mechanization Status and Future Prospects. Available from: https://www.researchgate.net/publication/278019970_In_Pakistan_Agricultural_Mechanization_Status_and_Future_Prospects [accessed Sep 03 2018]. The experts had consensus over the importance of observer data which, they said, was vital for fisheries management, providing an independent source of detailed and high-quality information on fishing activities and catches. Effective management of shared tuna stocks in the Indian Ocean, they said, could only be achieved through provision of consistent and robust data for which there was a need to establish and strengthen national observer programmes by regional countries. In this regard, there was a specific suggestion for use of modern instruments such as vessel monitoring system, electronic logbooks and electronic monitoring systems. Fabio Fiorellato, the data coordinator at the IOTC secretariat, provided updates on the level of compliance with the IOTC Regional Observer Scheme (ROS). According to him, details of 375 observers from 15 CPCs (Contracting Parties and Cooperating, non-contracting parties) — as of today — have been provided to the IOTC secretariat in accordance with the ROS requirements and that these do not yet include Pakistani observers as it doesn’t have a scientific national observer programme. Participants explored alternative protocols to support observer data collection and reporting tools during the workshop. One of them was the crew-based observer scheme being successfully implemented by Pakistan. Presenting Pakistan’s tuna fisheries’ status, Mohammad Moazzam Khan of WWF-P said that the country had a substantially large tuna fleet catching about 70,000 tonnes of tuna every year. Of the eight tuna species found in Pakistan, the three dominating ones were yellow fin, skipjack, longtail tuna, which constituted 70 per cent of the tuna landing, he said, adding that kawakawa, frigate tuna, bullet tuna and stripped tuna were other tuna species found in the country’s waters. On shortcomings in data collection, he said that his organisation had initiated an important crew-based programme whereby information was collected through fishermen. The programme had received international recognition. “Pakistan can contribute significantly to the national economy by developing proper fish handling and processing facilities and, at the same time, complying with the IOTC requirements,” he observed. Speakers included director general of conservation and rehabilitation of marine resources, Iran Fisheries Organisation, Dr Reza Shahifar, senior researcher at the Fisheries Research Institute, Mozambique, José Sebastião Halafo, fisheries development commissioner at the Ministry of Maritime Affairs Asad Rafiq Chandna and secretary of Balochistan coastal development and fisheries Arshad Hussain Bugti. The workshop in the next two days will discuss the feasibility of adopting alternative data collection methods in order to ensure science-based management regime for tuna fisheries of the Indian Ocean countries. The move is part of a project to promote cultivation of olive on commercial basis in the country. A total of 550,000 plants will be imported under the project which is being implemented by the National Agricultural Centre. The project for the promotion of cultivation of olive on commercial basis has been approved under the Public Sector Development. Dr Bari said that a survey of the potential areas had been completed and it was found that these areas were best suited for olive plantation. The olive cultivation will not only offer an ‘olive branch’ to peace in Fata, but will also serve as a source for livelihood of farmers in the entire Waziristan belt and agencies of Fata. IN Pakistan’s context, rice statistics are pretty impressive. Sown on 2.89 million hectares (about 10 per cent of total cropping area), it earned $2 billion (around 8pc of export income) for the country. Put it in the agricultural context, it is second to wheat in acreage and, in economic terms, only second to cotton (and its allied products as per Pakistan Bureau of Statistics data) in export earnings. It accounts for 3.1pc of value-addition in the agriculture sector and varyingly contributes 1.3-1.6pc to the GDP. Last year, it assumed added significance when production hit 7.4 million tonnes placing Pakistan on the list of the 10 largest producers on the world rice chart. According to the Economic Survey of Pakistan (2017-18), the area under rice increased by 6.4pc — 2.74 million hectares in 2016-17 to 2.89 million hectares and production swelled by 8.7 per cent — from 6.84 million tonnes to 7.44 million tonnes. Both these factors helped Pakistan post a 28pc increase in rice export. According to data from the Rice Exporters Association of Pakistan (Reap), it sent out a little over four million tonnes (for $2 billion) in 2018, as compared to 3.44 million tonnes for $1.6 billion in 2017. This showed a significant growth of 27.7 per cent in terms of value and 17 per cent in terms of quantity. As far as profiling of rice is concerned, its three board categories are: basmati (long grain and aromatic), coarse (IRRI type) and a generic term called “others.” The last type comprises of hybrid, unapproved and some smuggled varieties that have crept in due to relaxed official control. What adds to national seed confusion is the fact that the country has approved 108 varieties in the last 15 years — from 2003 to 2018. All of them are now entitled to sale. However, only 48 of them are actually released and found in the field, depending on requirements of different ecological zones. It is the Chinese hybrids which have made the difference in the last two years. Punjab (with all kinds of basmati, super, IRRI and hybrids) leads the national production scale with a contribution of 53pc. Sindh (IRRI and hybrids) follows with 26pc, Balochistan (IRRI, hybrids) with 12pc and the remaining 9pc comes from the Khyber Pakhtunkhwa, which has many local coarse varieties for hills and plains. Punjab’s contribution may increase as hybrid varieties are now getting more space while competing crops lose economic sheen. However, this happy rice scenario has two sore points: it is still stuck in a low yield groove and failing in international retail markets. 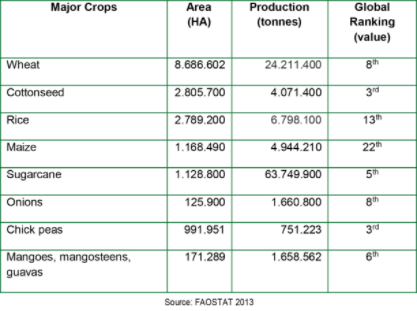 Despite a massive influx of seeds, Pakistan has not been able to break beyond 2.56 tonnes per hectares production. The world average is 4.7 tonnes per hectare production. With high yielding seeds and recommended practices, 4 tonnes per hectare is easily achievable. The federal Ministry for Food Security and Research took an initiative in 2015 for improving yield and tradable surpluses and enlisted the Chinese for help. For the next two years, both sides made a beeline towards each others’ fields and laboratories. It resulted in better hybrid seeds arriving in Pakistan and making a difference the very next year i.e. 2018. Last year’s three-pronged increase was the result of the same effort: the area increased by 6.4pc, production went up by 8.7pc and average yield jumped from 825 kilogram per acre in 2010-11 to over 1,000 kilograms. Despite this, improvements on the supply side and corresponding initiatives on the marketing side — domestic and international — is still a distant dream. Exports are largely restricted to bulk dumping in Middle Eastern markets while brand development is encouraged for domestic markets. These brands can then go beyond national borders and claim a niche in the world market.